Does Drinking Red Wine Affect Triglycerides? Moderate alcohol consumption may lower your risk of heart disease, says the Harvard School of Public Health. This is defined as up to two drinks per day for men and one drink daily for women, with one drink being equivalent to 12 ounces of beer, 1.5 ounces of spirits or 5 ounces of wine, such as red wine. For people with a high blood triglyceride level, however, drinking red wine might be a concern. High triglyceride levels can increase your risk of heart disease. Ask your doctor for a recommendation regarding alcohol. 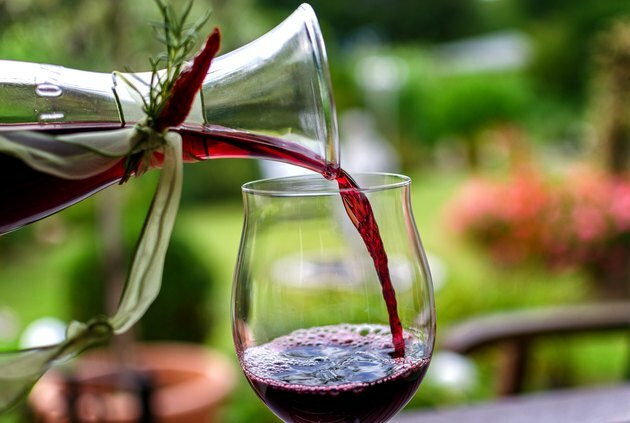 Consuming alcoholic beverages like red wine may cause an increase in your blood triglyceride level, according to University of Colorado Health Sciences Center professor of medicine Michael T. McDermott. A review study published in the "International Journal of Vascular Medicine" in 2011 reported that this is especially true for people who consume more than the recommended amount of alcohol per day. In these individuals, triglyceride levels may remain elevated overnight after drinking alcohol with a meal. Alcohol from beverages like red wine increases the amount of very low density lipoproteins, or VLDL, produced by your liver. VLDL is a type of cholesterol that carries triglycerides. The more VLDL in your blood, the higher your triglyceride level will be and the more likely your arteries will accumulate cholesterol buildup that can lead to heart disease. Alcohol may also contribute to higher triglycerides by inhibiting lipoprotein lipase, an enzyme that would otherwise break down VLDL and chylomicrons, another type of fat-carrying particle. Each 5-ounce serving of red wine contains approximately 125 calories. If you're following a 2,000-calorie diet, one glass of red wine would supply more than 6 percent of your daily caloric limit, and two glasses would be nearly 13 percent of that amount. Unless you're careful about the rest of the calories you take in, drinking alcohol could lead to weight gain and higher triglyceride levels. In addition, alcohol is metabolized faster than fats, protein and carbohydrates, meaning that other nutrients are more likely to be stored as fat, increasing your risk of weight gain. For the average healthy person who stays within the recommended daily alcohol limit, drinking red wine will not significantly affect blood triglyceride levels. If you have heart disease, though, talk to your doctor about whether you can safely drink alcohol. If you do include alcohol in your diet, make an effort to consume plenty of folate-rich foods like beans and green leafy vegetables, because alcohol interferes with the absorption and function of folate in the body.